Now in its second year, Evolve Cellars has given veteran Summerland wine grower Harry McWatters a place to hang his hat while his other winery, Time Estate, completes converting a movie theatre in downtown Penticton into a winery. Harry and his daughter, Christa-Lee McWatters Bond, leased the former Bonitas Winery last year, turning it into Evolve Cellars. The tasting room is at 20623 McDougald Road, Summerland. Bonitas opened in 2008, based on a lakeside vineyard north of Summerland – and coincidentally, not far north of Sumac Ridge Estate Winery, Harry’s original Okanagan winery. Sumac Ridge is now owned by Constellation Brands while Harry continues to have his finger prints are all over the BC wine industry. The scenery around Bonitas is so picturesque that Lawrence Hopper, the former owner, once arranged to have a helicopter based there, offering sightseeing tours. But when the Bonitas wines did not achieve the same altitude as the helicopter, the winery was put on the market. Harry took the opportunity to lease it as an outlet for wines more modestly priced than those of his other brands, Time and McWatters Collection. Last month, Encore Vineyards, the holding company for Time and Harry’s other brands, took over a former theatre and is now creating an urban winery in Penticton. That move was triggered when Harry sold the Sundial Vineyard – with its half-completed winery – to a Chinese consortium. Evolve Cellars wines have the benefit of winemaker Lawrence Buhler, the veteran winemaker who had been recruited by Encore in 2015. Lawrence, who has been involved in the wine industry since 1999, was previously the chief winemaker at Colio Estate Winery, a major Ontario winery based in Harrow. Previously, he has worked with Peller Estates and Angels Gate in Ontario, as well as Cape Mentelle in Australia. Lawrence, who has extensive family in the Okanagan, was attracted by the opportunity to work with Okanagan grapes. "It's going to be very exciting to make wines in the Okanagan and be close to family at the same time," he said last year. Evolve’s 2015 wines provide the first glimpse of his winemaking hand with Okanagan grapes. Here are notes on four wines just being released. Evolve Riesling 2015 ($16.99 This wine has aromas of citrus with floral notes and a hint of honey. On the palate, there are flavours of citrus, apple and peach. The flavours and the aromas are lifted by the surprising amount of residual sugar, 23 grams. But winemaker Lawrence Buhler has balanced the wine very nicely: there also are 11 grams of acidity. Asa result, the finish is tangy and seems almost dry. 88. Evolve Pinot Gris 2015 ($15.99). The wine has a clean “fresh air” aroma of spring blossoms with hints of white peach. On the palate, there are flavours of nectarine and pear with a hint of spice on the finish. 90. Evolve Gewürztraminer 2015 ($15.99). This has an appealing aroma of spice, lychee and grapefruit. On the palate, there are flavours of lychee, ripe nectarine, honeydew melon, all punctuated with spice and an off-dry finish. 89. Evolve Rosé 2015 ($16.99). The wine has a light salmon pink hue with aromas of watermelon and wild strawberry. It delivers juicy flavours of strawberry, cherry and watermelon. The slightly off-dry finish lifts the fruity aromas and flavours. 90. Now in its second year, vinPerdu Cellars of Oliver, a charming boutique winery, has increased production of most of its wines and has added a premium red called Hidden Corner. Everyone to whom I have spoken to about this winery has mentioned the warmth and friendliness of the tasting room – and then they add that the wines also are good. That is a fine reputation that has begun to put the winery on the radar screen of those who tour wineries on, or near, the Golden Mile. vinPerdu is not on the Golden Mile; it is on the wrong side of the highway. But you can see the Golden Mile from here if that is important to you. The winery is operated by Ray and Wendy Coulombe, together with their two daughters (whose partners also pitch in). Catherine, who formerly had a catering business in Montreal, now manages vinPerdu’s wine lounge and is mentoring with a winemaking consultant. Nathalie, who has become a vineyardist, is an artist and displays her excellent work in the tasting room. Ray, who was born in Edmonton and grew up in Vancouver, ran an advertising company in Montreal for many years until closing it in 2001. Drawn back to the West, Ray and Wendy looked for a community in which to retire and found a house with a five-acre vineyard just south of Oliver in 2009. He arranged to have wine made from his grapes in 2013. The winery was built in 2014 and the tasting room opened last year. One of the strong appeals of this winery is the welcome extended by the Coulombe family, one or other of which usually is on hand to greet visitors. vinPerdu Pinot Gris 2014 ($20.90). This is a crisp and refreshing white with aromas and flavours of citrus, honeydew melon and apples. 90.
vinPerdu Chardonnay 2014 ($27.90 for 91 cases). This wine has citrus aromas and tropical flavours with a hint of butterscotch and very subtle oak. 90.
vinPerdu Gamay Noir 2014 Unfiltered ($27.90 for 121 cases). This is a second release of the 2014 Gamay Noir. This is a juicy and happy wine with aromas and flavours of strawberries and cherries. The silky texture adds to the charm. 90.
vinPerdu Cabernet Franc 2014 ($28.90 for 209 cases). Production has been doubled from the previous vintage. This is a well-structured red with long ripe tannins. There are brambly aromas and spicy flavours of raspberry and blackberry with a touch of oak. 90.
vinPerdu Compass 2013 ($29.90 for 191 cases). This is a blend of 62% Cabernet Sauvignon, 25% Merlot and 12% Cabernet Franc. It has aromas of cassis with flavours of black currant and black cherry. The long ripe tannins give the wine a fleshy texture. 91.
vinPerdu Hidden Corner 2014 ($37.90 for 70 cases). This wine is 67% Merlot and 33% Cabernet Franc selected from the very best barrels in the cellar. This is a delicious wine with a concentrated texture softened by 14 months aging in barrel. The Merlot contributes flavours of black cherry while the Cabernet Franc adds notes of blackberry. There is also a lovely hint of vanilla in the aroma. 92. Painted Rock Estate Winery is so excited about its 2015 Chardonnay that it has already distributed some hand-bottled samples for review. The wine is actually scheduled to be bottled on May 30. I would expect it will have a month or so of bottle age before it is released to the market, if only because wines – especially whites - suffer profound bottle shock from bottling and need time to recover. But when you see this wine, do pick up a few bottles. It will sell for $30.50 plus tax. Painted Rock has every right to be excited about this decadently sensual wine. I scored it 92 points. The wine has ravishing tropical aromas and flavours, ranging from lychee and peach to citrus. The fruit is so vivid that I took it to be an unoaked Chardonnay. Of course, Painted Rock does not do unoaked Chardonnay. The winery achieved all of this bright and layered flavour first by doing three micro-harvests in its Chardonnay block. Each harvest brought in grapes with different flavour profiles and ripeness. Then 40% of the wine was aged about eight months in new French oak, another 40% was aged in second-fill French oak. The final 20% was aged in stainless steel. Only the latter portion went through malolactic fermentation. When blended, the ML fraction added texture. But preventing 80% from going through ML meant that the winery preserved the bright acidity – hard to do in a hot year like 2015 – which gives this wine a lively, tangy finish. The aromatic and tropical characters of this wine led me to ask what clones are in the vineyard. The answer is French clone 548 and clone 76. Whoever advised Painted Rock owner John Skinner when he was planting advised him well. I have recently tasted two other Chardonnays that are also very good and not yet on the market. Little Engine Winery, currently under construction on Naramata Road, is owned by former Calgarians Steven and Nicole French. The tasting room, just south of the Red Rooster winery, is expected to be open by July 1. The plan is that 30% of the production will be Chardonnay. I have been able to tasted two pre-release Chardonnays from Little Engine: a 2015 Silver Label Chardonnay, which will sell for about $33, and 2014 Gold Label Chardonnay, which will be priced $55 a bottle. I rated the former 92 and the latter 93. Little Engine’s Silver Label is similar in style to Painted Rock: Scott ages 50% in French oak (25% new) and 50% in tank. He allows some ML but does not let it go too far because he also wants to preserve the tropical fruit flavours and the refreshing acidity. The Gold Label (or reserve) is more boldly oaked, with 15 months in French barrels. But the wine has so much fruit that it handles the oak very well. The wine is very elegant. Both wineries have made good clonal choices and both have good winemaking. Painted Rock is a winery with an established reputation while Little Engine will very quickly emerge as its equal. What is encouraging is that two of the Okanagan’s top producers are embracing Chardonnay, championing a wine that was out of favour five or 10 years ago. There is no better way to re-establish Chardonnay than with several top flight examples. In a happy conjunction of events, Township 7’s 15th anniversary last year coincided with one of the Okanagan’s best vintages. That quality assessment is backed up by three 2015 white wines just released by the winery. In the past several years, the winery has undergone a number of key changes. These included a change of ownership. The new owners, in the usual style of Chinese owners, have maintained an extremely low profile. It is clear, however, that they are committed to ensuring the winery makes quality wines and continues to provide good hospitality experiences for wine tourists. The Township 7 winery in Langley – the original of its two properties – was renovated last year with upgrades to the grounds and with the addition of a VIP tasting room serving, among others, members of the winery’s wine club. At the winery’s Naramata Bench winery, winemaker Mary McDermott has presided over the cellar since 2014. Last fall, the owners put up the money to install a new crusher destemmer and several 5,000-litre French oak tanks. This year, the entire cellar will be nearly doubled in size. “This provides our winemaker and her team the necessary space for the additional small lot wines that we have planned,” the winery says in a note accompanying the three spring releases. Township 7 Sauvignon Blanc 2015 ($17.97 for 898 cases). This zesty wine begins with aromas of herbs and lime, leading to flavours of lime and lemon. There is good weight on the palate and the wine has a crisp, clean finish. 90. Township 7 7 Blanc 2015 ($17.97 for 498 cases). This is a blend of 40% Pinot Gris, 50% Gewürztraminer and 10% Riesling. The 14 grams of residual sugar here pop the flavours of peach, guava and citrus; but the acidity is bright enough to keep the finish fresh. The winery calls this an ice cream sundae but I think you will enjoy this even if you don’t have a sweet tooth. 90. Township 7 Muscat 2015 ($17.97 for 88 cases … only for the wine club). This wine begins with an appealing floral and spicy aroma, leading to flavours of herbs and a hint of ginger. The palate is light and the finish is dry. This is a delicate wine to be enjoyed just for the purity of its fruit flavours and aromas. 91. Head-turning wines: that best describes the premium wines being released by British Columbia’s newest boutique label, The Similkameen Collective. The wines are anchored on fruit from the 100-acre Blind Creek Vineyard, one of the most highly regarded vineyards in the Similkameen Valley. Winemaker J-M Bouchard first made wine from Blind Creek fruit for Road 13 Vineyards soon after he joined Road 13 as the winemaker in 2011. The enthusiasm he developed for those grapes appears to have been a trigger leading to the formation of the Collective. The first four wines, all in limited quantities, are now finding their way into the market. The pricing is aggressive ($35 to $60 a bottle) but the quality is there to back it up. Blind Creek, which was developed 10 or 12 years ago, is owned by Larry Lund (former owner of Okanagan Hockey School in Penticton) and his friend, businessman Ron Bell. These gentlemen, along with Penticton builder Jim Morrison, hold one-quarter interest in the Similkameen Collective. A quarter is owned by Road 13 and a quarter is owned by J-M. The final quarter is held by Vancouver wine merchant Brian Berry. That speaks for the benchmark that he has set for the wines from the Similkameen Collective – a standard he thinks he can achieve. The early plans for the vineyard involved the development of a winery. The owners of the vineyard retained Lawrence Herder, then a winemaker and consultant in the Similkameen, to create a business plan in 2009. For undisclosed reasons, the winery did not proceed and the owners since have sold grapes to numerous wineries, including Road 13. The Similkameen Collective seems a first step in realizing those early plans. It is, however, a “virtual” winery in that no winery has yet been built on the vineyard. The wines are made and sold under Road 13’s license. J-M is a native of Sherbrooke, Quebec. He developed a passion for wine after studying business and hotel management and working in Montreal hotels. In 1998, he went to Australia, enrolling in Charles Sturt University’s winemaking program. While there, he got hands on experience working with Penfolds and with a smaller premium producer called Torbreck Vintners. “I worked at Torbreck in 2002 and learned to co-ferment Syrah with Viognier,” J-M recounts. “I even fell into the tank there, with a smile, while doing some pump overs.” Why the smile? Because he thinks the wine in that tank eventually was released at $200 a bottle. After Australia, he spent some time in various European vineyards. Then he came back to Canada to work with Sumac Ridge Estate Winery before moving to Ontario’s Hidden Bench Winery. He returned eagerly to British Columbia when Road 13 recruited him in 2011. From his first vintage here, he concluded that the best fruit in the cellar came from Blind Creek. The initial release of wines from the Collective is about 500 cases. For now, the production growth will be determined by the demand for these ultra-premium wines. If the project takes off, J-M has access to more grapes. Here are notes on the current releases, which are sold in six-packs from orders@tscwine.com. Similkameen Collective Roussanne 2013 ($35 for 70 cases). This is a rich and luscious wine that was fermented in a concrete egg. That seems to account for the palate-coating texture; that and the ripeness of the fruit. It has aromas and flavours of ripe apricot with a touch of warmth on the generous finish. “I don’t think eggs deserve to have all wines,” the winemaker says. “Some wines do not improve in the egg but the Roussanne is phenomenal.” 92. Similkameen Collective Syrah & Viognier ($45 for 83 cases). The two varieties are co-fermented. The wine begins dramatically with aromas of plum jam exploding from the glass. On the palate, there are layered flavours of plum, black cherry, delicatessen meats and spices and white pepper. The long ripe tannins give the wine generous texture. 92. Similkameen Collective GSM 2013 ($50 for 104 cases). This is a blend of Grenache fermented on Syrah skins, with a dash of Mourvedre in the final blend. It was aged in neutral oak (the 2014 GSM is being aged in concrete). This wine manages to be bold and elegant at the same time. It begins with aromas of plum and blueberry and delivers a mouthful of ripe berry flavours supported by long, polished tannins. 93. Among the memorable experiences in wine touring, visiting the cellar of a sparkling wine producer is near the top of the list. 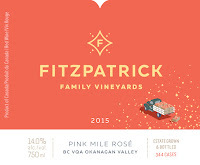 Starting September this year, what promises to be the Okanagan’s best sparkling wine cellar tour will begin welcoming the public at Fitzpatrick Family Vineyards south of Peachland. The former Greata Ranch Vineyards winery is completing a spectacular redevelopment to accommodate a new 8,000 case winery, a little more than half of it sparkling wine. The underground cellars will accommodate 120,000 bottles of bubbly. 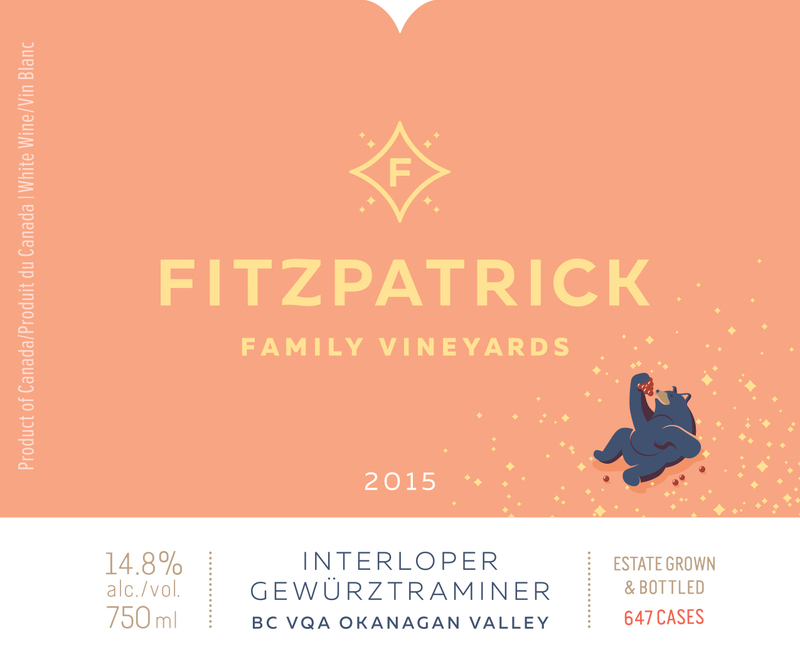 This week, months in advance of opening its wine shop, Fitzpatrick Family Vineyards (FPV) is releasing its first table wines. The winery’s debut sparkling wine, 380 cases from the 2012 vintage, is completing aging and will be released this fall when the tasting room opens. 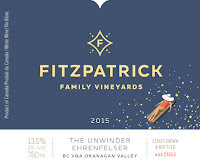 The winery, based on a 40-acre lakeside vineyard south of Peachland, was operated from 2003 until the spring of 2014 as Greata Ranch Vineyards by Gordon Fitzpatrick and his father, Senator Ross Fitzpatrick, who then also owned CedarCreek Estate Winery. Early in 2014, CedarCreek was purchased by Anthony von Mandl, the owner of Mission Hill Family Estate Winery. The Fitzpatricks, who had not expected von Mandl’s offer, had been planning a $2 million renovation to CedarCreek. Instead, they turned their attention on Greata Ranch. The Fitzpatricks have a long and emotional relationship with Greata Ranch. The FPV Rosé is labelled The Pink Mile in an allusion to how Greata Ranch looked in its glory days as an orchard when the peaches were in blossom. The property is named after George W. Greata, a British immigrant who arrived in the Okanagan in 1895. After securing water rights and building an irrigation line from a nearby creek, Greata planted the first apple trees in 1901. The orchard flourished under the subsequent owners, the Long family. A 1949 article in the Family Herald and Weekly Star reported that the orchard's average annual crop totalled 485 tons of cherries, pears, apricots, plums and peaches; and the packing house also handled 25,000 cases of apples from the area each year. The enterprise run by the Long brothers was a major business in its time, with about 75 full-time employees and a dock on the lake from which produce was transported to railhead. The year after they sold it in 1965, a very cold winter decimated the orchard. The ranch passed through several owners and uses before becoming a derelict property with squatters’ cabins on the shore. Senator Fitzpatrick bought it in 1994, cleaned it up and planted the vineyard in 1995. During the past 20 years, most of the grapes – notably Pinot Noir and Chardonnay – ended up in CedarCreek wines. A decade ago, as part of a real estate development project, a few vintages of Greata Reserve Chardonnay and Reserve Pinot Noir were produced before both the luxury housing proposal and the reserve program were shelved. Since the sale of CedarCreek, the Fitzpatricks have turned their full attention on recreating Greata Ranch as a producer of premium sparkling wine. The initial vintages of sparkling wine were made by Darryl Brooker, then the CedarCreek winemaker and how chief winemaker at Mission Hill. He was assisted by Taylor Whelan, who made the 2014 and 2015 still wines for FFV. He had just settled in as the FFV winemaker until this week, when he was appointed CedarCreek’s winemaker. Gordon is currently recruiting a replacement for FFV. Looking for a career he was more passionate about, he studied winemaking at Brock University and got a job in 2009 at Hillebrand winery, a Niagara on the Lake winery with a major sparkling wine program. His boss was Darryl Brooker, who moved to CedarCreek in 2010. Taylor followed Darryl to CedarCreek in 2012 after acquiring additional winemaking experience in New Zealand and Australia. Taylor is interested specifically in cool climate grape varieties and in sparkling wine. Taylor had already begun to stamp a style on FFV, making wines that are fresh and with good fruit. The FFV winery is being developed to provide a major hospitality program, in part because the business plan calls for selling much of the production at the cellar door. Gordon’s research included touring close to 30 sparkling wine producers in Champagne and in California. Each tour, limited to perhaps 12 persons, will last from an hour to an hour and a half. Video stations in the cellar will show those steps in the production process not always being done live. For those not interested in a cellar tour, there will be tasting bars and lounges with food service. Beginning in 2017, teams of chefs will prepare lunches and, on several evenings, dinner. 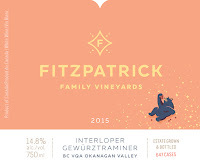 Fitzpatrick Interloper Gewürztraminer 2015 ($18.50 for 566 cases). The models for this wine included the great wines of Alsace. The wine is bold, with aromas and flavours of spice, lychee, grapefruit and grapefruit rind. About 20% of the wine was fermented in barrel and perhaps that accounts for the fleshy texture. Taylor says: “This is the one wine that I am relatively unapologetic about being big and intense, and not afraid of residual sugar.” 91. 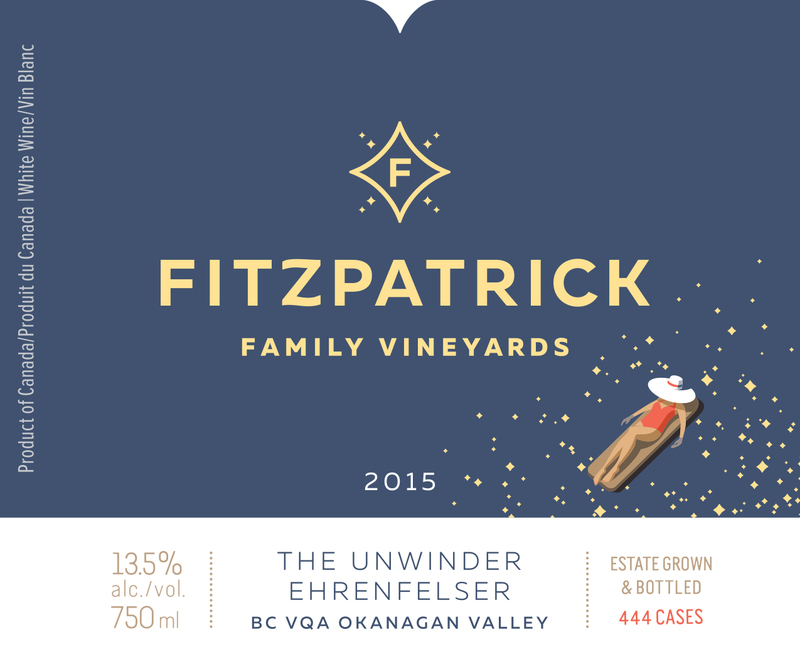 Fitzpatrick The Unwinder Ehrenfelser 2015 ($18.50 for 444 cases). The winemaker’s objective with this white variety – a star in the CedarCreek portfolio – is to make another powerful, aromatic wine. The wine begins with an appealing fruity aroma (peach and stone fruit), leading to flavours of apricot, peach and ripe apple. The finish is slightly off dry. 91. 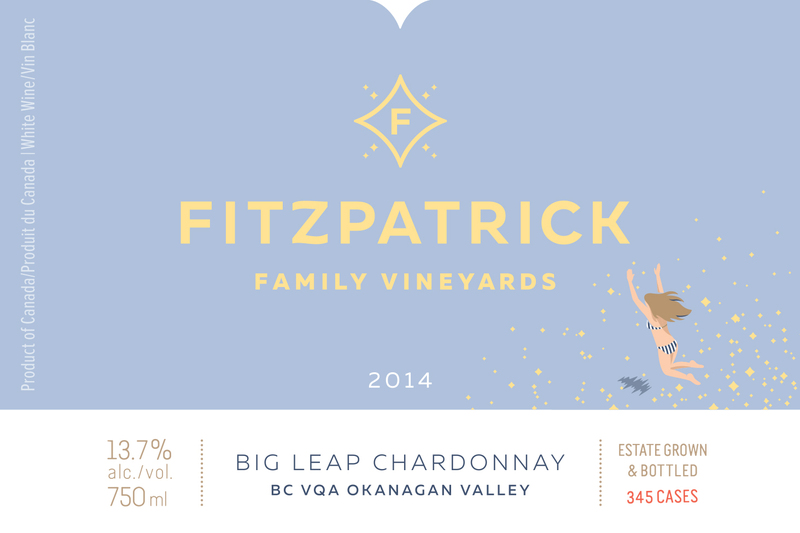 Fitzpatrick Big Leap Chardonnay 2014 ($24.50 for 345 cases). This elegant wine is fermented in French oak barrels (seven percent new). The wine begins with aromas of citrus and peach. On the palate, there are flavours of tangerine and apple with a very slight hint of oak. While the wine has good weight, the bright acidity gives it an appealing clarity and freshness. 93. 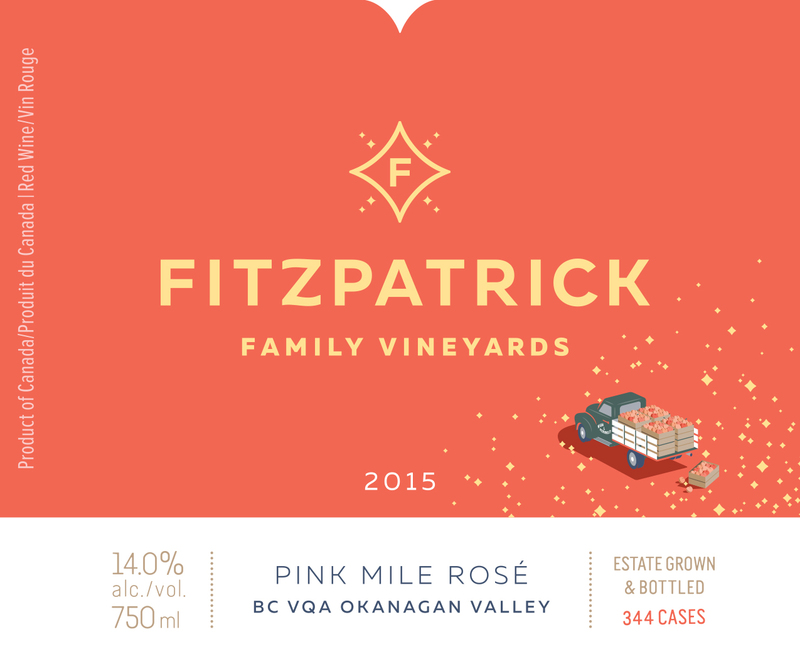 Fitzpatrick Pink Mile Rosé ($18.50 for 344 cases). This is made with Pinot Noir. Light rose petal in hue, the wine has aromas of strawberry and flavours of strawberry with twist of orange rind. There is a hint of residual sweetness on the finish. 90. The spring release wines from Culmina Family Estate Winery include a rosé and two white varietals. I have notes on all of them but I want to give special attention to the winery’s Grüner Veltliner, the renowned Austrian white. Culmina called its wine Unicus since the release of the first vintage in 2013 because it was the Okanagan’s first Grüner Veltliner. There still is not a lot of Grüner Veltliner – GV for short - being grown in British Columbia; only two other producers (De Vine Vineyards and BC Wine Studio) come to mind. I believe one or two other growers have planted the variety recently. The only reason that the variety was not planted sooner is that, until recently, the growers had no source for virus-free vines; or no source that the Canadian government would recognize. It is a variety that should flourish, especially in the Okanagan. In her book, Wine Grapes, Jancis Robinson [with colleagues Julia Harding and José Vouillamoz] describes GV as an “internationally fashionable variety” that is on a bit of a roll, having broken out of its home base of Austria, the Czech Republic and neighbouring countries. The GV at Culmina, where it is well grown, shows some characters comparable with a well-made Austrian GV. Culmina also grows Riesling in the same vineyard as GV, a mountainside property called Margaret’s Bench. The winery has released five vintages of Riesling but just three vintages of the more recentky-planted GV. Both are fine wines. I preferred the GV as the more demonstrative of the two in the glass. Riesling is a variety that flowers with a few years of age, at which time it should have no difficulty matching the appeal of GV. The three wines reviewed here are available at the winery and to members of the Culmina wine club (there is not enough volume to list them in the BC liquor stores). I would encourage purchasers to pick up a few extra bottles of the two white wines to see how they develop with age. The winery says one to three years for the GV and three to five years for the Riesling. Culmina Unicus 2015 ($27). This is 100% GV; some 24% was fermented in a concrete amphora, 33% in a concrete egg and 43% in stainless steel. This makes for a complex, richly textured wine. It begins with tropical aromas of citrus with that classic hint of white pepper. On the palate there are flavours of lychee and grapefruit. The acidity is fresh and the finish just goes on and on. 92. Culmina Decora 2015 ($21). This is 100% Riesling. This was fermented entirely in stainless steel. The wine’s racy acidity gives this wine a brightness in its youth and great ability to age. It begins with aromas of lemon and lime zest. These are echoed on the palate, along with a backbone of chalky minerals. At this stage in its life, the wine is tightly wound, with a laser-like focus. 89-91. Culmina Saignée 2015 ($22). The varietal blend is 42% Merlot, 28% Cabernet Sauvignon, 21% Cabernet Franc and 9% Malbec. This wine presents with a hue of orange-tinted rose petals. Muscular and fleshy, the wine has aromas of cherry and strawberry with flavours cherry, ripe apple and rose hip. The robust character and alcohol (14%) reflects the hot vintage. 89. Sea Star Vineyards & Winery on Pender Island debuted two years with startlingly good wines. The third vintage – 2015 – continues to be consistent, with the release of fresh and tangy wines that must be the envy of peers. Applause goes to owner David Goudge and his winemaker, Ian Baker. David, who has lived on Pender Island for nearly a decade years, purchased the former Morning Bay four and a half years ago after it had closed. The original winery, an attractive building set amidst the forest, was still there. So was the seven-acre vineyard that had been planted in 2002. David resuscitated the property by investing in new equipment, a climate controlled barrel cellar and an updated wine shop. To manage the vineyard and make the wines, he hired Ian Baker, who had formerly done the same duties at Mistaken Identity Vineyards on Salt Spring Island. Ian is a one-time Department of Fisheries employee and the former operator of a landscape business in Qualicum Beach on Vancouver Island. More to the point, he was a long-time amateur winemaker with, as one of his former partners said, “a box of medals.” He came to Sea Star in 2013 after about four years with Mistaken Identity. The Pender Island grapes in Sea Star’s whites are from the 5,000 vines at Sea Star’s vineyard and the 7,000 vines at the 5.5-acre vineyard at Clam Bay Farm on North Pender Island. Sea Star Stella Maris 2015 ($24 for 402 cases). This is a blend of Gewürztraminer, Pinot Noir, Pin9t Gris, Riesling, Ortega and Schönburger. The wine begins with a dramatic aroma of spice, rose petals and lime. It is crisp and vibrant on the palate with flavours of lychee, pear and citrus, and has a lively and lingering finish. 91. Sea Star Ortega 2015 ($20 for 522 cases). Dry and savoury, this wine begins with aromas of herbs, grapefruit and melon. On the palate, there are flavours of lime, honeydew melon, green apple and grapefruit. This is a pristine and focussed white with a zesty finish. 91. Sea Star Siegerrebe 2015 ($20 for 523 cases). This early-ripening German white is almost always the most aromatic grape in the vineyard – so much so that variety is notorious for attracting wasps. Well, the wasps know a good drop of juice. Aromas of herbs, spice and lemon leap from the glass. On the palate, there is remarkably intensity of flavour – herbs, gooseberry and citrus. The wine is crisp with a dry finish. This varietal can come across as grapey in the hands of a lesser winemaker. Not this one: this is clean and refreshingly balance. 92. Sea Star Salish Sea 2015 ($22 for 711 cases). This is an aromatic blend of Ortega and Siegerrebe. It begins with aromas of lemon and lime leading to flavours of tropical fruits with light hints of herbs and spice on the finish. The wine again is refreshingly crisp. 91. Sea Star Blanc de Noir 2015 ($24 for 724 cases). Very pretty in the glass, this rosé begins with clean fruity aromas of strawberry and raspberry. These are echoed on the palate along with flavours of crabapple, cranberry and rhubarb. The finish is crisply dry. 89.